Civilians played an important role in maintaining peace through Liberia’s first democratic transition of power. Leading up to and during the 2017 elections, local Liberians engaged in a variety of peacebuilding activities aimed at urging their fellow citizens to “say no to violence.” Participants included members of the Liberia National Police and pen-pen motorcycle taxi drivers, groups that historically have had violent interactions, working side by side along with market people, youth, and other community members. These activities did not just bring local citizens together but emphasized the importance of peace and the need to maintain and sustain it. National and local peace initiatives are mutually influential. The success of one increases the chances of success in the other. Groups seeking to develop peace zones must understand the important role of local participation, the ties to local resistance forces, and the role played by external actors. Knowledge of successful resistance movements increases the effectiveness and strength of new peace movements. Local Citizens Play Key Role in Promoting Peaceful Elections in Liberia. By Jasmine Linabary, Stacey Connaughton, Jennifer Ptacek, Meghana Rawat, & Grace Yeanay for Diplomatic Courier. March 12, 2018. 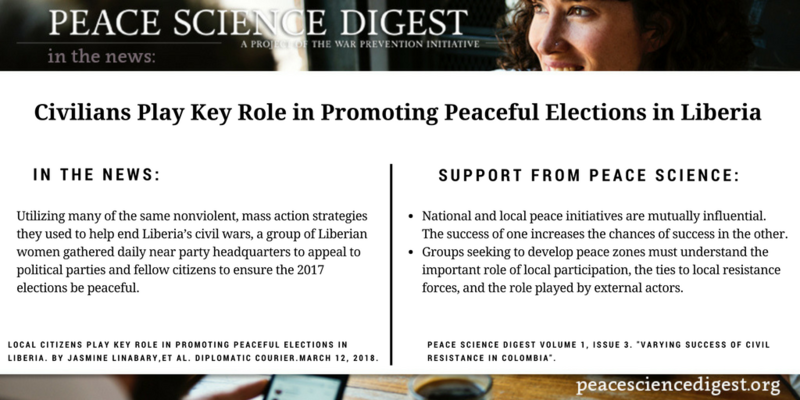 Peace Science Digest Volume 1, Issue 3. “Varying Success of Civil Resistance in Colombia”.